Michigan Tribal Search Engine. Bruce Sarjeant who serves as the Reference, Documents & Maps Librarian at the Lydia M. Olson Library of Northern Michigan University developed this custom Google search engine that searches the Internet domains of the 12 federally-acknowledged tribes in the state of Michigan. American Mosaic : American Indian Experience provides a brief timeline of important events in the history of Indians in Michigan. Note: subscription required for access or a visit to library that is a subscriber. If you have a chance consider visiting the Michigan's First People exhibits at the Michigan Historical Museum (our state museum) in Lansing, Michigan which has a number of exhibits about the history of American Indians in Michigan. The Sanilac Petroglyphs near Cass City, Michigan, are the oldest record of Native Americans in Michigan. More than 500 years before Columbus arrived, a group of historic people known as the Hopewells came to West Michigan. They built large, earthen mounds along the river to bury their dead with pottery, tools, jewelry and other items. At one time, as many as 35 to 40 mounds were on this site. Today, 13 survive, making them perhaps the best preserved Hopewell mounds in North America and earning them the designation of a National Historic Landmark. Owned and protected by the Grand Rapids Public Museum. "The Hopewell", The Mitten, July 2012. Michigan's Mysterious Indian Mounds. Article by Vivian M. Baulch, The Detroit News, June 6, 1997. Gillman, Henry. "The Mound-Builders in Michigan." Michigan Pioneer and Historical Society, Collections 2 (1880): 40-52. Council of Three Fires. (in Anishinaabe: Niswi-mishkodewin), lso known as the People of the Three Fires; the Three Fires Confederacy; or the United Nations of Chippewa, Ottawa, and Potawatomi Indians. The council is a long-standing Anishinaabe alliance of the Ojibwe (or Chippewa), Ottawa (or Odawa), and Potawatomi North American Native tribes....Originally one people, or a collection of closely related bands, the ethnic identities of Ojibwa, Ottawa, and Potawatomi developed after the Anishinaabe reached Michilimackinac on their journey westward from the Atlantic coast. Using the Midewiwin scrolls, Potawatomi elder, Shup-Shewana, dated the formation of the Council of Three Fires to 796 AD at Michilimackinac. In this Council, the Ojibwe were addressed as the "Older Brother," the Odawa as the "Middle Brother," and the Potawatomi as the "Younger Brother." Consequently, whenever the three Anishinaabe nations are mentioned in this specific and consecutive order of Ojibwe, Odawa, and Potawatomi, it is an indicator implying Council of Three Fires as well. In addition, the Ojibwa are the "keepers of the faith," the Odawa are the "keepers of trade," and the Potawatomi are the designated "keepers/maintainers of/for the fire" (boodawaadam), which became the basis for their name Boodewaadamii (Ojibwe spelling) or Bodéwadmi (Potawatomi spelling). Though the Three Fires had several meeting places, Michilimackinac became the preferred meeting place due to its central location. From this place, the Council met for military and political purposes. "The Three Fires", The Mitten, September 2001. 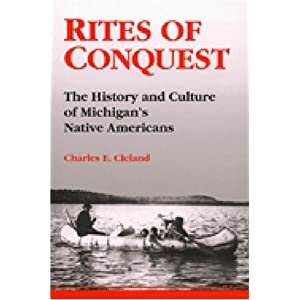 For a nice overview, see A brief history of Michigan Indians / Charles E. Cleland, Michigan State University. Lansing : Michigan Department of State, Michigan History Division, 1975. 38pp. Government Documents, Michigan Documents Collection (3 West) E78.M6 C54 1975. Michigan's First People by Hillsdale Educational Publishing. An overview for elementary school children. 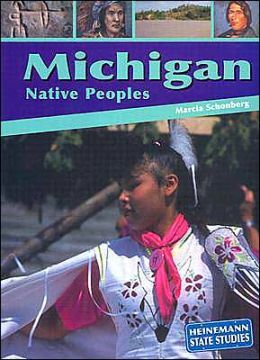 Michigan's First People by Macmillan/McGraw Hill. Another overview for elementary school children. Native American History In Michigan. An overview for children provided by the University of Michigan. Michigan voices : our state's history in the words of the people who lived it / compiled and edited by Joe Grimm. Detroit, Mich. : Detroit Free Press : Wayne State University Press, 1987. 207pp. MSU Main Library Stacks F566 .M525 1987 (Also available via Google Books, or at least the first chapters on Native Americans in Michigan. Primitive man in Michigan. University of Michigan, 1925. Available in print from the Library of Michigan or online via the HathiTurst. Native Americans in the Great Lakes Region. Includes Map of Tribal Locations in 1760. Excerpt from GEO 333: Geography of Michigan and the Great Lakes Region (MSU text). Indians In the Great Lakes Region. Excerpt from GEO 333: Geography of Michigan and the Great Lakes Region (MSU text). Michigan Native Trails, 1760. Excerpt from GEO 333: Geography of Michigan and the Great Lakes Region (MSU text). That the People May Live #5: Blacks and Native Americans of Early Detroit. Yes, there were Native Americans and African Americans in Michigan in early Detroit. Encyclopedia of Michigan Indians : Tribes, Nations and People of the Northern Woodlands. St. Clair Shores, Mich. : Somerset, c1998- 2 vols. Reference (1 Center) E78.M6 E58 1998 : This work contains articles about tribes and biographies of famous Indians -- although the coverage focuses more on the Northern Woodlands of the United States than just Michigan. Daily Life articles are included to fully understand the history and culture of the American Indians. Also includes a lengthy section on history and treaty commitments. Native Peoples of the Great Lakes Region : Interesting collection of information by the Great Lakes Information Network Teach Project. 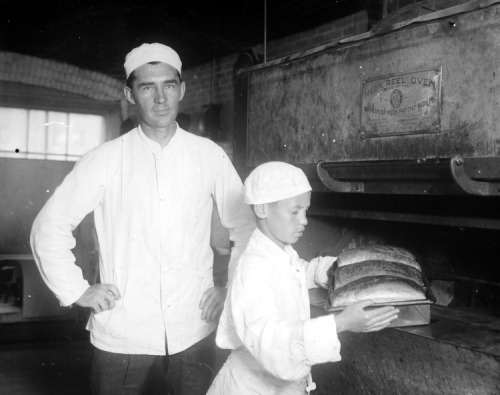 American Indian Boarding Schools: An Exploration of Global Ethnic and Cultural Cleansing. Developed by the Ziibiwing Center of Anishinabe Culture & Lifeways. Lissa Edwards, "To Educate the Indian", MyNorth, Mach 29, 2017. : At the Mount Pleasant Indian School they took you away from your family, made you stop speaking your native tongue and disciplined you like a soldier. But among the memories of drills and deprivation, graduates also tell unexpected stories of sanctuary and shelter. This story was published in the January 2002 issue of Traverse, Northern Michigan’s Magazine. Casino Gambling. An overview courtesy of the Central Michigan University Clarke Historical Library. Chippewa Tribe via Hodge, Frederick Webb, Compiler. The Handbook of American Indians North of Mexico. 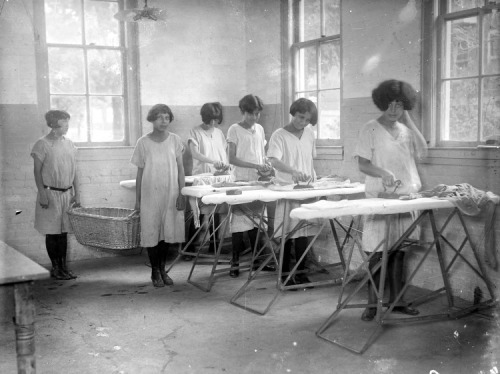 Bureau of American Ethnology, Government Printing Office. 1906 and AccessGeneology. Controversies and Cases : the Indigenous Peoples of Michigan. Courtesy of the Michigan Supreme Court Historical Society. Federal Education Policy & Off-Reservation Schools,1870-1933. An overview courtesy of the Central Michigan University Clarke Historical Library. Gun Lake Tribe (Also known a Match-e-be-nash-she-wish Band of Potawatomi Indians of Michigan) History. Gun Lake Tribe Historical Orientation. Gun Lake Tribe History Video. An Historical Analysis of the Saginaw, Black River and Swan Creek Chippewa Treaties of 1855 and 1864. A report by Anthony G. Gulig, Ph.D., Department of History, University of Wisconsin-Whitewater commissioned for the State of Michigan, July 30, 2007. History of the Ottawa and Chippewa Indians of Michigan. From Native American Nations web site. "The Huron Indians", The Mitten, May 2013. Indian Villages, Towns, and Settlements of Michigan via Hodge, Frederick Webb, Compiler. The Handbook of American Indians North of Mexico. Bureau of American Ethnology, Government Printing Office. 1906. and AccessGeneology. 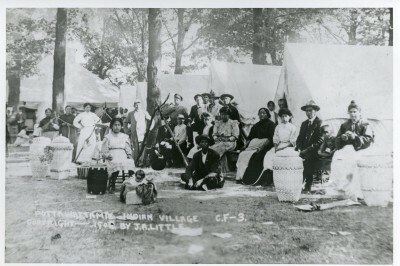 Kalamazoo’s First Residents: Our Native Americans. Courtesy of the Kalamazoo Public Library. Land Distribution and Ownership on the Isabella County Indian Reservation. An overview courtesy of the Central Michigan University Clarke Historical Library. Match-e-be-nash-she-wish Band of Potawatomi Indians of Michigan (Gun Lake Tribe) History. Michigan Indian Tribes via Swanton, John R. The Indian Tribes of North America . Bureau of American Ethnology, Bulletin 145. Washington DC: US Government Printing Office. 1953. and AccessGeneology. Michigan Native American Tuition Waiver Program. An overview courtesy of the Central Michigan University Clarke Historical Library. Michigan Odawa History Project. We will be uploading academic articles, legal materials, and other documents on this page in conjunction with the Center’s ongoing project to collect materials related to the histories of the Grand Traverse Band of Ottawa and Chippewa Indians, Little River Band of Ottawa Indians, and the Little Traverse Bay Bands of Odawa Indians. These materials will, of course, include information about other tribes as well. Part of TurtleTalk. Michigan State University College of Law Indigenous Law and Policy Center Blog. Morality vs. Legality: Michigan’s Burt Lake Indians and the Burning of Indianville by Matthew J. Friday. Relates the story of how Burt Lake Indians were driven from their land on Burt Lake and their attempts since then to receive federal recognition. Michigan Historical Review 33:1 (Spring 2007), 87-97. Native American Fishing Rights in Michigan. An overview courtesy of the Central Michigan University Clarke Historical Library. Native American History in Michigan. Written for school children by the University of Michigan. Native American Treaties: Their Ongoing Importance to Michigan Residents. When Indians and Europeans first met on the North American continent they brought distinct and very different world views to the encounter. Over several centuries the Indian communities of North America and the European immigrants who settled on this continent shared very mixed experiences that ranged from war to negotiation. This web page focuses on the negotiations that have occurred between Euro-Americans and three Native American communities, the Chippewa, Odawa, and Potawatomi. This web site explores the treaties that effect the people, Indian and Euro-American, who live in Michigan, and offers six case studies to explain how treaties signed between 1795 and 1864 had relevance in the past and continue to have importance today. Also see Understanding Treaties and The Historical Context Preceding Treaty Negotiation in the 1820s : ​​​An essay by Joshua D. Cochran and Frank Boles. All courtesy of The Clarke Historical Library at Central Michigan University (Mt. Pleasant, MI). Native Americans in Grand Rapids. Native Americans in Michigan. A site dedicated to those with Native American heritage and providing an online portal to documents for researching your family lines. Maintained by Patricia Wazny-Hamp. Native Americans in the Great Lakes Region. This page was created for GEO 333: Geography of Michigan and the Great Lakes Regiona courtesy by Dr. Randall J. Schaetzl of Michigan State University. Native Americans of the Clinton River Watershed. Includes bibliography. North American Indian Association (Detroit) History. Odawa Indians History. Eric Hemenway, Director of Repatriation, Archives and Records. Ojibwa entry by Loriene Roy from Countries and Their Cultures. Ojibwa entry from New World Encyclopedia. Ottawa Tribe entry via Hodge, Frederick Webb, Compiler. The Handbook of American Indians North of Mexico. Bureau of American Ethnology, Government Printing Office. 1906. and AccessGenealogy. Potawatomi entry from New World Encyclopedia. The Potawatomi Experience of Federal Removal Policy. An overview courtesy of the Central Michigan University Clarke Historical Library. Potawatomi Tribe via Hodge, Frederick Webb, Compiler. The Handbook of American Indians North of Mexico. Bureau of American Ethnology, Government Printing Office. 1906. and AccessGenealogy. Leslie Askwith, "The Awakening: Native Americans Share Their Culture Through Powwow Regalia", My North, April 1, 2008. This article was also featured in the March 2008 issue of Traverse, Northern Michigan’s Magazine. Tim Bebeau, "A Life of Subsistence Fishing on Grand Traverse Bay", MyNorth, June 6, 2016. This feature about life on the Linda Sue and fishing on Grand Traverse Bay was originally featured in the June 2016 issue of Traverse Magazine. Jeff Smith, "Aanii" [hello]: Kenny Pheasant's Quest, Odawa Language for the Masses", MyNorth, July 13, 2011. 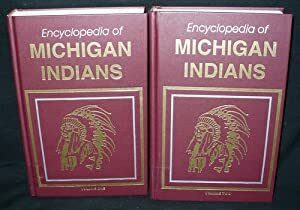 Encyclopedia of Michigan Indians : Tribes, Nations and People of the Northern Woodlands. Bay Mills Chippewa Indian Community (Bay Mills/Brimley) Also see wikipedia entry. Interlochen Public Radio reports about BMIC's fight with the State of Michigan to open a casino in Vanderbilt. Demographic breakout, MLPP, July 2016..
Grand Traverse Bay Band of Ottawa and Chippewa Indians (Peshawbestown/Suttons Bay) Also see wikipedia entry. Demographic breakout, MLPP, July 2016. Hannahville Indian Community Band of Potawatomi, (Wilson) Also see wikipedia entry. Demographic breakout, MLPP, July 2016. Keweenaw Bay Indian Community, Lake Superior Band of Chippewa Indians (Baraga) Also see wikipedia entry. Demographic breakout, MLPP, July 2016. Lac Vieux Desert Band of Lake Superior Chippewa Indians (Watersmeet) Also see wikipedia entry. Demographic breakout, MLPP, July 2016. Little River Band of Ottawa Indians (Manistee) Also see wikipedia entry.. Demographic breakout, MLPP, July 2016. The Little River Band is seeking permission to build a casino in Muskegon County..
Little Traverse Bay Bands of Odawa Indians (Harbor Springs) Also see wikipedia entry. Demographic breakout, MLPP, July 2016. Match-e-be-nash-she-wish Band of Potawatomi Indians of Michigan (Also known as Gunn Lake Tribe) (Dorr) Also see wikipedia entry. No demographic breakout available, MLPP, July 2016. Nottawaseppi Huron Band of Potawatomi Also see wikipedia entry.. Demographic breakout, MLPP, July 2016. Pokagon Band of Potawatomi Indians (Dowagiac) Also see wikipedia entry and Keepers of the Fire : The Pokagon Band of Potawatomi Indians. Demographic breakout, MLPP, July 2016. The Pokagon Band’s ten-county service area includes four counties in Southwestern Michigan and six in Northern Indiana. Its main administrative offices are located in Dowagiac, Mich., with a satellite office in South Bend, Ind. In 2007, it opened Four Winds Casino Resort in New Buffalo, Mich., followed by Four Winds Hartford in 2011, Four Winds Dowagiac in 2013 and Four Winds South Bend in January 2018. Saginaw Chippewa Indian Tribe (Mt. Pleasant) Also see wikipedia entry and history. Demographic breakout, MLPP, July 2016. Sault Ste. Marie Tribe of Chippewa Indians (Sault Ste. Marie) Also see wikipedia entry.. Demographic breakout, MLPP, July 2016. Interlochen Public Radio reports about tribe's fight with the State of Michigan to open a casino in Lansing. Visit the Michigan Tribal Government Page. Federally acknowledged tribes are not merely organizations of citizens who happen to be of Native American descent. Rather, they are sovereign governments that exercise direct jurisdiction over their members and territory and, under some circumstances, over other citizens as well. Tribal governments provide a wide array of governmental services to their members including lawmaking, tribal police and court systems, health and education services, and many more....The state generally does not have legal authority over tribal governments and tribal members when they are inside the tribe's territory - those lands designated as the tribe's reservation or trust lands. Instead, the state interacts with tribes on a government-to-government basis. This has lead in recent years to a number of formal government-to-government agreements on a variety of subjects including such matters as treaty fishing rights, taxation, water quality issues, economic development, and casino gaming. On this web page you will find links to such agreements and to various state government resources and information regarding tribes and tribal issues. You also find links to the tribal government web site for each of the twelve tribes. Includes links to existing compacts and agreements between the State of Michigan and the various tribes. Michigan Department of Human Services List of Federally Recognized Tribes (12). Also check out the Native American Resources page to learn more about services available for Native Americans in Michigan. Inter-tribal Council of Michigan, Inc. Represents eleven of the twelve federally recognized tribes in Michigan. Those being: Bay Mills Indian Community, Hannahville Indian Community, Keweenaw Bay Indian Community, Saginaw Chippewa Indian Tribe, Grand Traverse Band of Ottawa and Chippewa Indians, Little Traverse Bay Bands of Odawa Indians, Sault Ste. Marie Tribe of Chippewa Indians, Lac Vieux Desert Band of Lake Superior Chippewa Indians, Match-E-Be-Nash-She-Wish (Gun Lake Tribe), Pokagon Band of Potawatomi Indians, and the Nottawaseppi Band of Huron Potawatomi. Although the Little River Band of Ottawa Indians is not a member tribe of ITC, they still utilize some of the services we offer. State historic tribes not recognized by the Federal Government (listed in Michigan Indian Directory) from the Michigan Department of Civil Rights. Burt Lake Band of Ottawa and Chippewa Indians (Brutus) Also see wikipedia entry, A Bitter Memory: The Burt Lake Burn-out of 1900; Morality vs. Legality: Michigan’s Burt Lake Indians and the Burning of Indianville; More Federal Recognition: The Burt Lake Band Case; Commentary on Possible Burt Lake Band Casino Development. Patrick Sullivan, "Burnout : The Burt Lake Band Strives For recognition and restitution", Northern Express, March 23rd, 2015. Richard Wiles, "Honoring the Great Lakes' Woodland Indian Canoe Culture", Inland Seas: Quarterly Journal of the National Museum of the Great Lakes, Vol. 73, no. 1, Spring 2017. Grand River Bands of Ottawa Indians (Ishpeming/Grand Rapids). The Grand River Bands of Ottawa Indians were notified by the Office of Federal Acknowledgment in a Dec. 12 letter to the tribal chairman that its 1994 request for federal recognition was being “actively considered.”...The agency in the U.S. Department of the Interior will decide by Dec. 1 a “proposed finding” to determine if the Grand Rapids-based tribe has met seven criteria to allow department Assistant Secretary for Indian Affairs Kevin Washburn to move toward a final decision. Those who follow the arcane world of tribal recognition were surprised the Grand River Bands petition has gotten to this point....If the assistant secretary were to grant the tribe federal recognition, it would move forward plans of a development group to put an Indian casino at the Harbor 31 business park development on Muskegon Lake. However, the final recognition could take another two years and putting everything in place for a casino-based destination resort to be constructed could take an undetermined number of years beyond that. Source :Dave Alexander, "'Active consideration' of Grand River tribal recognition raises possibility of downtown Muskegon casino", MLive, February 21, 2014. Swan Creek Black River Confederated Ojibwa Tribes of Michigan (Saginaw). A group of Mt. Pleasant-based Native Americans, including 66 removed from the rolls of the Saginaw Chippewa Indian Tribe in November, are seeking federal recognition of the original three bands of American Indians that first settled in Isabella County in the mid-1800s....No one has disputed that most of those behind the effort are Native American descendants of the original three tribes, but they claim to have been disenrolled from the Saginaw Chippewa Tribe for historical quirks linked to inappropriate rulings and poor record keeping by the federal government. Source : Rick Mills, "Banished tribal members seek federal recognition", Mt. Pleasant Morning Sun, January 3, 2014. Mackinaw Bands of Chippewa and Ottawa Indians (Cheyboygen) Also see Mackinac Band Files for Federal Recognition, March 20, 2014. Federal Court Rejects Mackinac Tribe’s Bid for Federal Recognition, Turtle Talk, April 1, 2015. Procedures for Establishing That an American Indian Group Exists as an Indian Tribe. The Office of the Assistant Secretary—Indian Affairs is examining ways to improve the Department's process for acknowledging an Indian tribe, as set forth in regulations. This document announces a comment period, tribal consultation sessions, and public comment sessions on a preliminary discussion draft of potential revisions to improve the Federal acknowledgment process. Will this make it easier for tribes to be recognized by the federal government? Time will tell. Source : IndianZ, June 27, 2013. Michigan Indian Casinos by City. Ziibiwing Center of Anishinabek Culture & Lifeways, Mt. Pleasant, Isabella County. 989-775-4750. Ziibiwing Cultural Center Online Tour: A visit to the Ziibiwing Cultural Center prior to the Center being open courtesy of YouTube (2008). 2014 Exhibit: : The Mt. Pleasant Indian Industrial Boarding School belongs to a period of time known as the Era of Stolen Children or the American Indian Holocaust. This Federal school “educated” and systematically assimilated an average enrollment of three hundred students per year from 1893-1934. Administrative records indicated that only five children perished while attending the school during its 41-years of operation. To date, Ziibiwing researchers have identified over two hundred undocumented deaths directly attributed to this institution. For more information visit the Ziibiwng Blog or the Zibiiwing Center of Anishinabek Cutlure and Lifewasy Facebook Page. Ft. de Buade Indian Museum, St. Ignace, Mackinac County. 906-643-6627. For over three centuries, the Straits of Mackinac has been the center for commercial and military activity. Fort de Buade was built in 1683 by Olivier Morel de La Durantaye for the purpose of demonstrating to the Native Americans the power of France and to check the westward expansion of the British into the rich fur regions of the Great Lakes. The fort was named for Louis de Buade, Comte de Frontenac, the governor of New France from 1672 to 1682, and then again from 1689 until his death in 1698. For de Buade was the most important French outpost in northern Michigan west of Montreal. Breaking News: During August 2016, the musuem is loaning a "Captured Spirits Exhibit" on Makinac Island. For more information, see Stepahnie Fortino, "Captured Spirits Exhibit Makes Mackinac Island Debut", Town Crier, May 28, 2016. M-119/Tunnel of Trees (old Native American path, including the Council Tree, where tribal chiefs met in 1763), between Harbor Springs and Cross Village, Emmet County. Bay de Noc-Grand Island Trail (ancient Chippewa portage route), Hiawatha National Forest, Escanaba, Delta County. 906-786-4062. Ojibwe Indian exhibit, Harbour House Museum, Crystal Falls, Iron County. 906-875-4341. Native American Materials, Central Michigan University's Clarke Historical Library, Mt. Pleasant, Isabella County. 989-774-3352. Andrew J. Blackbird Museum, 368 E. Main, Harbor Springs, Emmet County. 231-526-0612. Totem Village, St. Ignace, Mackinac County. 906-643-8888. Harbor Springs History Museum (includes exhibits on Odawas and Native American treaty-signers), Harbor Springs, Emmet County. 231-526-9771. Ninga Aki Pathway (interpretative trail about Ojibwa life), Portage Bay State Forest Campground, Delta County. 906-452-6227. "Anishinabek: The People of This Place" exhibit, Public Museum, Grand Rapids. 616-456-3977. Besser Museum of Northeast Michigan, Alpena, Michigan. Check out the Naub-cow-zo-win Disc Collection. Gerald Haltiner recovered this group of artifacts in the 1950s and 1960s from a number of locations in and around Alpena. The round flat discs, ranging in diameter from ½ to 2 ½ inches, are unique and significant expressions of early Native American Culture in this region. About a third of the discs are inscribed with abstract symbols of powerful spiritual forms. Nokomis Learning Center. A non-profit Native American cultural learning center located in Okemos, Ingham County (517-349-5777), dedicated to the preservation and presentation of Anishinaabeg (Ojibwa, Odawa, and Potawatomi) arts, culture, and history. Also check the Nokomis Learning Center facebook page. Peter Whorf, "Nokomis Learning Center Gets to Heart of Michigan History", WKAR, May 17, 2016. Pentoga Park (includes Ojibwa wooden burial structures), Crystal Falls, Iron County. 906-265-3979. Museum of Ojibwa Culture, St. Ignace, Mackinac County. 906-643-9161. "The First People to 1900" exhibit, Michigan Historical Museum, Lansing. 517-373-3559. For the full article, see Zlati Meyer, "YOU HAVEN'T LIVED HERE UNTIL ... You learn about the state's American Indian heritage", Detroit Free Press, October 25, 2009. If you have other noteworthy books related to Native Americans in Michigan to add to this list, send an email to Jon Harrison. Alexander Henry's Travels and adventures in the years 1760-1776 / ed. with historical introduction and notes by Milo Milton Quaife. Chicago, R.R. Donnelley & Sons Company, 1921.340pp. Main Library F1013 .H52 1921 c.2 : Henry was at Mackinac in the years of the Pontiac's Rebellion. His account paints a rich picture of life, both Indian and white, on the upper Great Lakes. 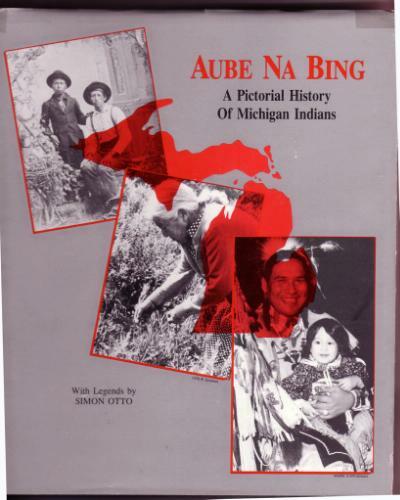 Aube na bing : a pictorial history of Michigan Indians / with legends by Simon Otto ; compiled by M.T. Bussey. [Grand Rapids, Mich. (45 Lexington, N.W.)] : Michigan Indian Press, . 124pp. Main Library E78.M6 A83 1989 : The photographs included in this book span the time from 1865 to 1988. In bridging these years, we intend to reveal the cultural changes endured by the Michigan tribes. The adjustment made by the Ojibwe, Potawatomi, and Ottawa of Michigan was a heroic one. As our tribal lands were being taken by treaties, allowing limited room for hunting and food gathering, the Michigan tribes were faced with relocation, escape to Canada or acceptance of European farming methods and Christian teachings. Some were relocated on reservation lands in Kansas, while many chose to flee to Canada where they could continue to live in a traditional way. It is the group that chose to struggle and survive in Michigan that are poignantly revealed in this documentary. 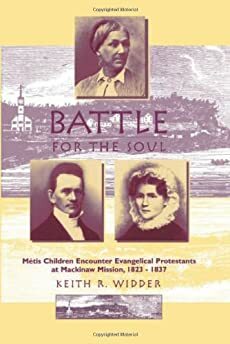 Battle for the Soul : Metis Children Encounter Evangelical Protestants at Mackinaw Mission, 1823-1837 / Keith R. Widder. East Lansing, Mich. : Michigan State University Press, c1999. 254pp. Main Library E99.M47 W54 1999 : In 1823 William and Amanda Ferry opened a boarding school for Métis children on Mackinac Island, Michigan Territory, setting in motion an intense spiritual battle to win the souls and change the lives of the children, their parents, and all others living at Mackinac. Battle for the Soul demonstrates how a group of enthusiastic missionaries, empowered by an uncompromising religious motivation, served as agents of Americanization. The Ferrys' high hopes crumbled, however, as they watched their work bring about a revival of Catholicism and their students refuse to abandon the fur trade as a way of life. The story of the Mackinaw Mission is that of people who held differing world views negotiating to create a "middle-ground," a society with room for all.... Widder's study is a welcome addition to the literature on American frontier missions. Using Richard White's "middle ground" paradigm, it focuses on the cultural interaction between French, British, American, and various native groups at the Mackinac mission in Michigan during the early 19th century. The author draws on materials from the American Board of Commissioners for Foreign Missions archives, as well as other manuscript sources, to trace not only the missionaries' efforts to Christianize and Americanize the native peoples, but the religious, social, and cultural conflicts between Protestant missionaries and Catholic priests in the region. Much attention has been given to the missionaries to the Indians in other areas of the US, but little to this region. 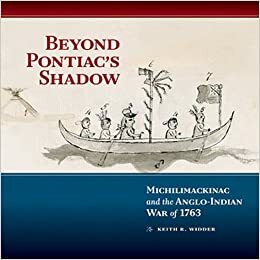 Beyond Pontiac's Shadow : Michilimackinac and the Anglo-Indian War of 1763 / Keith R. Widder. East Lansing : Michigan State University Press, 2013. Main Library E83.76 .W53 2013: A new book celebrating the 250th Anniversary of the attack at Fort Michilimackinac. Also see Pontiac vibe; Local author details complex history surrounding Native American . Article by Bill Castanier appearing in the Lansing City Pulse, March 5, 2014. Blackbird's song : Andrew J. Blackbird and the Odawa people / Theodore J. Karamanski. East Lansing : Michigan State University Press, c2012. 293pp. Main Library E99.O6 B534 2012 : For much of U.S. history, the story of native people has been written by historians and anthropologists relying on the often biased accounts of European-American observers. Though we have become well acquainted with war chiefs like Pontiac and Crazy Horse, it has been at the expense of better knowing civic-minded intellectuals like Andrew J. Blackbird, who sought in 1887 to give a voice to his people through his landmark book History of the Ottawa and Chippewa People. Blackbird chronicled the numerous ways in which these Great Lakes people fought to retain their land and culture, first with military resistance and later by claiming the tools of citizenship. This stirring account reflects on the lived experience of the Odawa people and the work of one of their greatest advocates. A brief history of Michigan Indians / Charles E. Cleland, Michigan State University. Lansing : Michigan Department of State, Michigan History Division, 1975. 38pp. Government Documents, Michigan Documents Collection (3 West) E78.M6 C54 1975. 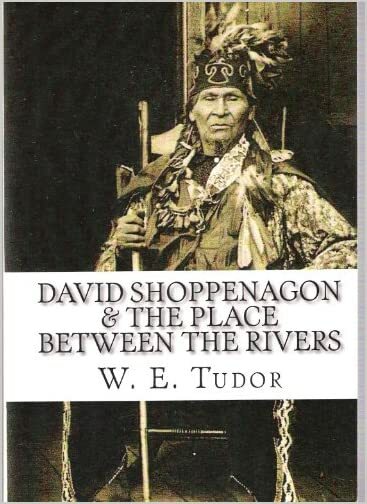 David Shoppenagon & the place between the rivers / by W.E. Tudor. Michigan?] : W.E. Tudor,  227pp. Main Library E99.C6 S484 2010 : A biography of the noted Chippewa Indian David Shoppenagon and a brief history of the places where he lived, The Place Between the Rivers. Shoppenagon was the son of a Chippewa Chief whose clan lived in and around Saginaw, Michigan. When the Saginaw forests began to be depleted of timber and game due to lumbering and farming, Shoppenagon struck out on his own and moved his family to a remote area in northern Michigan, near present day Grayling. As lumbermen slowly moved to the Grayling area to harvest giant white pines, Shoppenagon adapted to the changed environment and won the respect of those hardy pioneers who carved a bustling new town from the wilderness. Disputed waters : Native Americans and the Great Lakes fishery / Robert Doherty. Lexington, Ky. : University Press of Kentucky, , ©1990. 172pp. Main Library E99.C6 D64 1990 : Doherty's study of the struggle of the Chippewa and Ottawa Indians of Michigan's Upper Peninsula to defend their traditional fishing rights in the Great Lakes raises questions about whether the federal courts are capable of resolving conflicts over allocation of natural resources. The author's perspective comes from working among the tribes involved and from interviewing the major participants on both sides of the legal controversy. After setting the historical context of treaty rights in the 19th century, Doherty centers his major 20th-century analysis on the issues arising from United States v. Michigan. In that suit, a negotiated settlement at least temporarily settled the case between Native American treaty fishing rights and the interests of sports fishers in Michigan. Dream catchers : legend, lore and artifacts / Cath Oberholtzer. Richmond Hill, Ont. : Firefly Books, 2012. 144pp. Main Library E99.C6 O24 2012 : An investigation into the symbol of Native heritage. In Ojibwe (or Chippewa in the United States) culture a dream catcher is a hand-crafted willow hoop with woven netting that is decorated with sacred and personal items such as feathers and beads. The Native American tradition of making dream catchers--hoops hung by the Ojibwe on their children's cradleboards to "catch" bad dreams--is rich in history and tradition. Although the exact genesis of this intriguing artifact is unknown, legend has it that a medicine woman forms a circle from a willow branch and, with sinew, borrows the pattern from a spider, weaves a web, and hangs it over the bed of a sick child who recovers by morning. In some versions dream catchers catch good dreams and let bad ones through, while others catch bad dreams and let good dreams through. This legend accompanies dream catchers offered for sale across North America and beyond. These themes, among others, are carried throughout this book which explores the appropriation of dream catchers by Native Americans of different nations, as well as the New Age movement. Dream Catchers also discusses the blending of two religious philosophies whereby Native and Christian icons are mixed. More than 40 color photographs feature contemporary dream catchers and artifacts with informative captions that identify and comment on the different patterns, their significance and history. Dream Catchers features the work of Native artist Nick Huard who creates dream catchers in his studio in Kahnawake outside of Montreal. 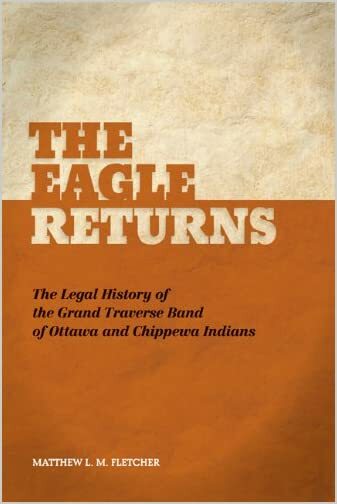 The eagle returns : the legal history of the Grand Traverse Band of Ottawa and Chippewa Indians / Matthew Fletcher. East Lansing : Michigan State University Press, c2012. 257pp. Main Library, Faculty Collection (1 East), and Schaeffer School of Law Library E78.M6 F57 2012 (Also available online) : Fletcher (director, Indigenous Law and Policy Center, Michigan State U.) surveys the governmental, legal, and political history of the Grand Traverse Band of northwest lower Michigan, with an emphasis on the status of the tribe both as a treaty tribe and as the first tribe recognized by the Department of the Interior. The book begins with a review of the history of the Grand Traverse Band during treaty times, focusing on the 1836 Treaty of Washington and the 1855 Treaty of Detroit. The author then describes the dispossession of the Band's land base following the 1855 Treaty, the eventual federal recognition of the Band, and the Band's treaty rights fight. There is also material on the development of modern tribal law and justice systems and the Grand Traverse Band's gaming operations and related business enterprises. 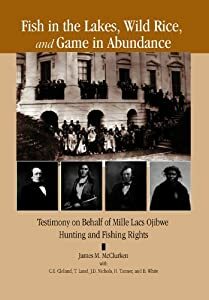 Fish in the Lakes, Wild Rice, and Game in Abundance : Testimony on Behalf of Mille Lacs Ojibwe Hunting and Fishing Rights / James M. McClurken, compiler ; with Charles E. Cleland ... [et al.]. East Lansing, Mich. : Michigan State University Press, c2000. 572pp. Main Library and Faculty Book Collection KFM5905.6.H85 F57 2000 (Also available online) : In 1837 members of the Mille Lacs Band of Ojibwe Indians signed a treaty with the US that guaranteed to them (at the pleasure of the president of the United States) the privilege of hunting, fishing, and gathering the wild rice on the lands, the rivers, and the lakes included in the territory ceded. A century and a half later the Band filed a suit against the State of Minnesota for interfering with those rights. In 1990 the courts interpreted the treaty's historical circumstances, the intention of the parties, and the treaty's implementation. To assist them at trial in interpreting the treaty and to testify for them, the tribe hired six scholars: Charles Cleland, James McClurken, Helen Tanner, John Nichols, Thomas Lund, and Bruce White. In this work, they discuss the circumstances under which the treaty was written, the personalities involved in the negotiations, and the legal rhetoric of the times, as well as the related legal conflicts between Native Americans and non-Natives. Footprints :Stories of Native Americans in West Central Michigan / Wallace K. Ewing, Ph. 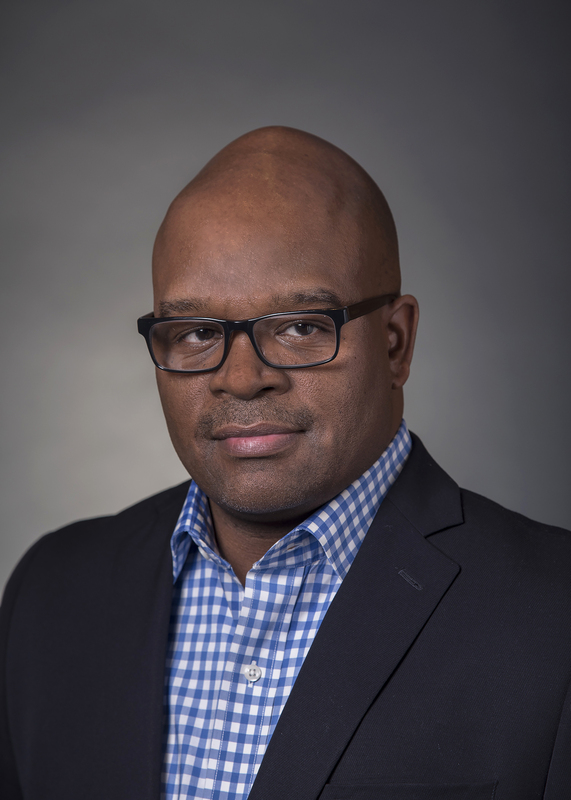 D. [United States] : Wallace K. Ewing,  552pp. Main Library E78.M6 E95 2016. : The Indians whose presence shaped the history of West Central Michigan typically are marginally represented in books and articles about the past. My 554-page book titled “Footprints” attempts to correct that omission by telling the stories of individual Native Americans who once walked the Grand River Valley, Lake Michigan’s wooded dunes and the land between. Included are the chiefs, their tribal members, those who claimed both Native American and European descent, and a few of the whites who played critical roles, for better or worse, as they interacted with Indians in the early years of settlement. 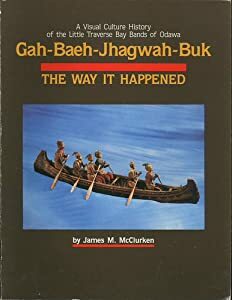 Gah-baeh-Jhagwah-buk = The way it happened : a visual culture history of the Little Traverse Bay Bands of Odawa / by James M. McClurken. East Lansing, Mich. : Michigan State University Museum, c1991. 129pp. Main Library E99.O9 M35 1991 : provides valuable information, insights, and history related to the Native People in Northern Michigan. The photos provide visual references, and show the life and sophistication of the people and communities. Great Lakes Indian Accommodation and Resistance During the Early Reservation Years, 1850-1900 / Edmund Jefferson Danziger, Jr. Ann Arbor : University of Michigan Press, c2009. 322pp. Main Library E78.G7 D367 2009 : During the four decades following the War of 1812, Great Lakes Indians were forced to surrender most of their ancestral homelands and begin refashioning their lives on reservations. The challenges Indians faced during this period could not have been greater. By century's end, settlers, frontier developers, and federal bureaucrats possessed not only economic and political power but also the bulk of the region's resources. It is little wonder that policymakers in Washington and Ottawa alike anticipated the disappearance of distinctive Indian communities within a single generation. However, these predictions have proved false as Great Lakes Indian communities, though assaulted on both sides of the international border to this day, have survived. Danziger's lively and insightful book documents the story of these Great Lakes Indians—a study not of victimization but of how Aboriginal communities and their leaders have determined their own destinies and preserved core values, lands, and identities against all odds and despite ongoing marginalization....Utilizing eyewitness accounts from the 1800s and an innovative, cross-national approach, Danziger explores not only how Native Americans adapted to their new circumstances—including attempts at horse and plow agriculture, the impact of reservation allotment, and the response to Christian evangelists—but also the ways in which the astute and resourceful Great Lakes chiefs, councils, and clan mothers fought to protect their homeland and preserve the identity of their people. Through their efforts, dreams of economic self-sufficiency and self-determination as well as the historic right to unimpeded border crossings—from one end of the Great Lakes basin to the other—were kept alive. For a selection of more current books received by the library, click on the New Books tab. Imprints : the Pokagon Band of Potawatomi Indians and the City of Chicao / John N. Low. East Lansing, Michigan : Michigan State University Press,  318pp. Main Library E99.P8 L694 2016 (Also available online) : The Pokagon Band of Potawatomi Indians has been a part of Chicago since its founding. In very public expressions of indigeneity, they have refused to hide in plain sight or assimilate. Instead, throughout the city's history, the Pokagon Potawatomi Indians have openly and aggressively expressed their refusal to be marginalized or forgotten--and in doing so, they have contributed to the fabric and history of the city. Imprints: The Pokagon Band of Potawatomi Indians and the City of Chicago examines the ways some Pokagon Potawatomi tribal members have maintained a distinct Native identity, their rejection of assimilation into the mainstream, and their desire for inclusion in the larger contemporary society without forfeiting their "Indianness." Mindful that contact is never a one-way street, Low also examines the ways in which experiences in Chicago have influenced the Pokagon Potawatomi. Imprints continues the recent scholarship on the urban Indian experience before as well as after World War II. 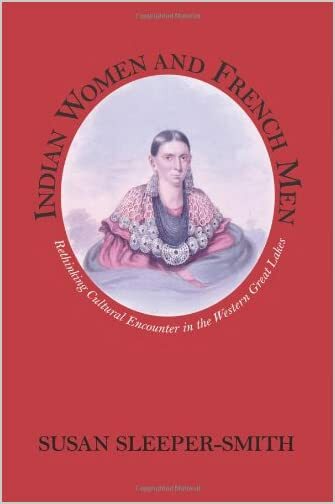 Indian women and French men : rethinking cultural encounter in the Western Great Lakes / Susan Sleeper-Smith. Amherst : University of Massachusetts Press, c2001. 234pp. Main Library E78.N76 S54 2001 : A center of the lucrative fur trade throughout the colonial period, the Great Lakes region was an important site of cultural as well as economic exchange between native and European peoples. In this well-researched study, Susan Sleeper-Smith focuses on an often overlooked aspect of these interactions-the role played by Indian women who married French traders....Drawing on a broad range of primary and secondary sources, she shows how these women used a variety of means to negotiate a middle ground between two disparate cultures. Many were converts to Catholicism who constructed elaborate mixed-blood kinship networks that paralleled those of native society, thus facilitating the integration of Indian and French values. By the mid-eighteenth century, native women had extended these kin linkages to fur trade communities throughout the Great Lakes, not only enhancing access to the region's highly prized pelts but also ensuring safe transport for other goods....Indian Women and French Men depicts the encounter of Old World and New as an extended process of indigenous adaptation and change rather than one of conflict and inevitable demise. By serving as brokers between those two worlds, Indian women who married French men helped connect the Great Lakes to a larger, expanding transatlantic economy while securing the survival of their own native culture. As such, Sleeper-Smith points out, their experiences illuminate those of other traditional cultures forced to adapt to market-motivated Europeans. The Indians of Hungry Hollow / Bill Dunlop and Marcia Fountain-Blacklidge. Ann Arbor, Mich. : University of Michigan Press, c2004. 178pp. Main Library E78.M6 D86 2004: Michael Blake's Dances with Wolves transformed denigrating Indian sterotypes and created widespread interest in Native American culture. The subsequent popularity of books on this topic underscores the power of a tale well told. 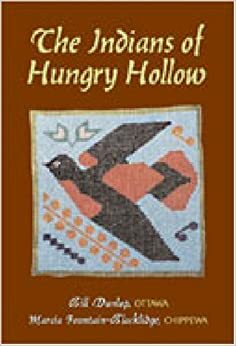 While Blake's story relates the early chapters of Native Americans' survival struggles, later accounts of this struggle remain untold....The Indians of Hungry Hollow authentically presents these later chapters. The days of Hungry Hollow have long passed, but the opportunity to capture its lessons of community, strong values, and an urge to thrive in matters of the heart and soul are still very much with us....These are stories of survival, community, sharing, and caring. The situations are often dire: winter in the middle of the Depression; an Indian settlement illegally taken from its inhabitants and set on fire; boaters stranded by bad weather and threatened with death. But if the situations are extreme, the telling of the stories is consistently optimistic yet completely without self-pity or sentimentality, and the characters always find a way through the darkness....Dunlop's unique style of storytelling is compelling and informative, and these historically significant stories help to elucidate the transition of the American Indian culture from post-tribal days to the present...Bill Dunlop is a respected Ottawa elder and storyteller. Marcia Fountain-Blacklidge is a professional writer, counselor, and consultant. Indiantown : an Ojibwe village becomes a farm community / by Roselynn Ederer. Saginaw, Mich. : Thomastown Pub. Co., c2011. 280pp. Main Library E99.C6 E34 2011 : A compilation of oral histories, property deeds, genealogy records, newspaper accounts, other records and photos that tell the history of this Buena Vista Township farming community that emerged around the banks of the Cheboyganing Creek. The land surrounding the creek was first settled by the Chippewa Indians when the land was granted to them by the U.S. Government in the 1850s. When their land was sold in the 1870s, German Catholic immigrants who were working in the Carrollton sawmills bought and cleared the land for farming. The community was then called Indiantown and became a part of the “Heartland of America.” Its residents were an important part of Saginaw’s past history and played a significant role in developing Michigan’s agricultural industry. Laughing Whitefish / Robert Traver ; foreword by Matthew L. M. Fletcher. East Lansing : Michigan State University Press, c2011. 220pp. 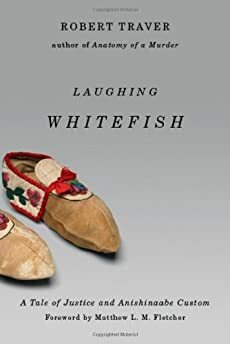 Main Library PS3570.R339 L38 2011 : Laughing Whitefish is an engrossing trail drama of ethnic hostility and the legal defense of Indian treaties. Young Lawyer William (Willy) Poe puts out a shingle in Marquette, Michigan, in 1873, hoping to meet a woman who will take him seriously. His first client, the alluring Charlotte Kawbawgam, known as Laughing Whitefish, offers an enticing challenge - a compelling case of injustice at the hands of powerful mining interests. Years earlier, Charlotte's father led the Jackson Mining Company to a lucrative iron ore strike, and he was then granted a small share in the mine, which the new owners refuse to honor. Willy is now Charlotte's sole recourse for justice. Laughing Whitefish is a gripping account of barriers between Indian people and their legal rights. These poignant conflicts are delicately wrought by the pre-eminent master of the trial thriller, the best-selling author of Anatomy of a Murder. This new edition includes a foreword by Matthew L.M. Fletcher, Director of the Indigenous Law and Policy Center at Michigan State University, that contextualizes the novel and actual decisions of the Michigan Supreme Court ruling in favor of Charlotte. Also see ‘Laughing Whitefish’ resurfaces; Republished 1965 novel still has much to say about Indian law. Article by Bill Castanier appearing in Lansing City Pulse, November 16, 2011. The legacy of Shingwaukonse : a century of native leadership / Janet E. Chute. Toronto ; Buffalo : University of Toronto Press, , ©1998. 359pp. Main Library E99.C6 S483 1998 : This book examines the careers of the Ojibwa chief Shingwaukonse, also known as Little Pine, and of two of his sons, Ogista and Buhkwujjenene, at Garden River near Sault Ste Marie. Theirs was a period in which the Great Lakes Ojibwa faced formidable challenges from entrepreneurs, missionaries, and bureaucrats, as well as from new policies set by the Canadian state. Shingwaukonse sought to establish links with the new government agencies, to preserve an environment in which Native cultural values and organizational structures could survive, and to devise strategies to enable the formation of band governments capable of assuming a degree of proprietorship over the resources on Native land. Using an impressive array of evidence from a huge range of government, church, manuscript, and oral sources, Chute reconstructs a period of energetic and sometimes effective Aboriginal resistance to pressures visited on the community. She demonstrates that Shingwaukonse and his sons were vigilant in their attempts to maximize the autonomy and security of the Garden River Ojibwa even while many other parties insisted on their assimilation. The Legacy of Shingwaukonse contributes greatly to anthropological debates about Ojibwa leadership and to a historical understanding of the relationship between Native peoples and newcomers throughout the nineteenth century. Massacre at Mackinac : Alexander Henry's travels and adventures in Canada and the Indian territories between the years 1760 and 1764 / Edited by David A. Armour. [Mackinac Island, Mich.,] : Mackinac Island State Park Commission,  119pp. Main Library F551 .H42 1966 : Part 1 of the author's Travels and adventures in Canada and the Indian territories between the years 1760 and 1776, originally published in 1809. Masters of empire : Great Lakes Indians and the making of America / Michael A. McDonnell. New York : Hill and Wang, a division of Farrar, Straus and Giroux, 2015. 402pp. Main Library E99.O9 M36 2015 : "In 'Masters of Empire,' the historian Michael A. McDonnell reveals the pivotal role played by the native peoples of the Great Lakes in the history of North America. Though less well known than the Iroquois or Sioux, the Anishinaabeg, who lived across Lakes Michigan and Huron, were equally influential. Masters of Empire charts the story of one group, the Odawa, who settled at the straits between those two lakes, a hub for trade and diplomacy throughout the vast country west of Montreal known as the 'pays d'en haut.' Highlighting the long-standing rivalries and relationships among the great Indian nations of North America, McDonnell shows how Europeans often played only a minor role in this history, and reminds us that it was native peoples who possessed intricate and far-reaching networks of commerce and kinship, of which the French and British knew little. As empire encroached upon their domain, the Anishinaabeg were often the ones doing the exploiting. By dictating terms at trading posts and frontier forts, they played a crucial part in the making of early America. Through vivid depictions-- all from a native perspective-- of early skirmishes, the French and Indian War, and the American Revolution, Masters of Empire overturns our assumptions about colonial America. By calling attention to the Great Lakes as a crucible of culture and conflict, McDonnell reimagines the landscape of American history"
Michigan's first settlers : the Indians or native Americans / Nicholas P. Georgiody, Louis G. Romano, Robert C. Lusk. Okemos, MI : Argee Publications, 1998. 31pp. Special Collections Textbooks TR310. .G46 1998 : The history of the Indians in Michigan from earliest times to the present. Minong--the good place : Ojibwe and Isle Royale / Timothy Cochrane. East Lansing : Michigan State University Press, c2009. 285pp. Main Library E99.C6 C63 2009 (Also available online) : Minong (the Ojibwe name for Isle Royale) is the search for the history of the Ojibwe people's relationship with this unique island in the midst of Lake Superior. Cochrane uses a variety of sources: Ojibwe oral narratives, recently rediscovered Jesuit records and diaries, reports of the Hudson's Bay post at Fort William, newspaper accounts, and numerous records from archives in the United States and Canada, to understand this relationship to a place. What emerges is a richly detailed account of Ojibwe activities on Minong — and their slow waning in the latter third of the nineteenth century. ... Piece by piece, Cochrane has assembled a narrative of a people, an island, and a way of life that transcends borders, governments, documentation, and tidy categories. His account reveals an authentic 'history': the missing details, contradictions, deviations from the conventions of historical narrative — the living entity at the intersection of documentation by those long dead and the narratives of those still living in the area. Significantly, it also documents how non-natives symbolically and legally appropriated Isle Royale by presenting it to fellow non-natives as an island that was uninhabited and unused. Native Americans of Michigan's Upper Peninsula : a chronology to 1900 / Russell M. Magnaghi. [Marquette, Mich.] : Center for Upper Peninsula Studies, Northern Michigan University, c2009. 200pp. Main Library E78 .M6 M34 2009b : Includes bibliography of resources in back. 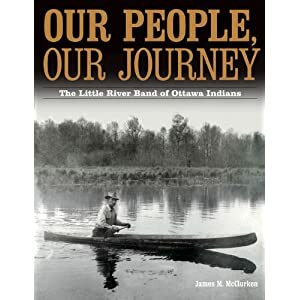 Our people, our journey : the Little River Band of Ottawa Indians / James M. McClurken. East Lansing : Michigan State University Press, c2009. 370pp. Main Library E99.O9 M355 2009 : For students, there is the history of the tenacity of a band abandoned by the US despite promises and of the struggle to achieve reaffirmation as a federally recognized tribe. These Ottawa were lied to, declared moribund, marginalized, and denied justice for over a century. McClurken's central thesis, supported by evidence, is that the Ottawa demonstrated adaptation but clung to their central values and community despite what was thrown at them. They are now federally recognized. An abundance of family-type pictures provides a human face to the struggle and to the joys of being Ottawa; Ottawa families and students can see these pictures as affirmations of Ottawa tenacity and humanity. 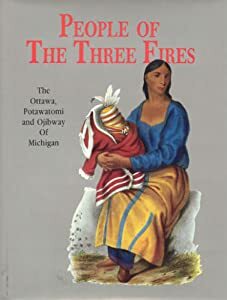 People of the three fires : the Ottawa, Potawatomi and Ojibway of Michigan / by James A. Clifton, George L. Cornell, James M. McClurken. [Grand Rapids, Mich.] : Grand Rapids Inter-Tribal Council, c1986. 118pp. Main Library E78.M6 C543 1986 (Also available online via ERIC) : This book accompanied by a student workbook and teacher's guide, was written to help secondary school students to explore the history, culture, and dynamics of Michigan's indigenous peoples, the American Indians. Three chapters on the Ottawa, Potawatomi, and Ojibway (or Chippewa) peoples follow an introduction on the prehistoric roots of Michigan Indians. Each chapter reflects the integration of cultural and historical information about the Indians. The chapter on the Potawatomi stresses the political activities and economic forces affecting the tribe in southwestern Michigan. It includes biographical information on 19th century Potawatomi leaders. The second chapter focuses on the subsistence patterns and indigenous environmental relations of the Ojibway, while touching on the spiritual connotations of their existence. It is a generic treatment of Ojibway life, customs, beliefs, and the subsequent federal policies affecting them. The chapter on the Ottawa provides an extended discussion of their contact with European powers and explores the Indians' responses and adaptations to changing environmental and sociopolitical circumstances. This book contains many historical photographs and a five-page bibliography. The Place of the Pike (Gnoozhekaaning) : a History of the Bay Mills Indian Community / Charles E. Cleland. Ann Arbor : University of Michigan Press, c2001. 146pp. Main Library and Faculty Book Collection E99.C6 C55 2001 : Throughout much of the nineteenth and twentieth centuries, the Ojibway people of Michigan's Bay Mills Indian reservation endured hopeless poverty, cultural repression, and deep racial prejudice. Despite such odds, they have survived as a people and a community through reliance on the bond of kin, the ability to reap and share the abundance of nature, and a strong belief in their identity as a native people....Drawn from oral accounts of tribal elders, The Place of the Pike tells the history of the Bay Mills community from the perspective of the people themselves, whose own view of the past is not cast in terms of federal Indian policy, academic theories, national economic trends, or the personages of American political life. Instead, the Indians of Bay Mills see their history in the life struggles of their own tribal heroes....In order to recapture the past, oral storytellers frequently employ visual imagery. These stories, combined with dozens of photographs from the tribe's photographic archives, make the text of The Place of the Pike come alive. This unique history will inform and fascinate a broad readership in Native American and Great Lakes history, community studies, and anthropology. Google preview. The Pokagons, 1683-1983 : Catholic Potawatomi Indians of the St. Joseph River valley / James A. Clifton. Lanham : University Press of America, c1984. 166pp. Main Library E99.P8 C545 1984 : The history of the Pokagon Band of southwest Michigan, the Potawatomis who were officially permitted to stay in their homeland. The Potawatomi / James A. Clifton ; Frank W. Porter III, general editor. New York : Chelsea House Publishers, c1987. 98pp. Main Library E99.P8 E99.P8 C547 1987 : Examines the history, changing fortunes, and current situation of the Potawatomi Indians. Includes a picture essay on their crafts. The Potawatomis, keepers of the fire / by R. David Edmunds. Norman : University of Oklahoma Press, c1978. 367pp. 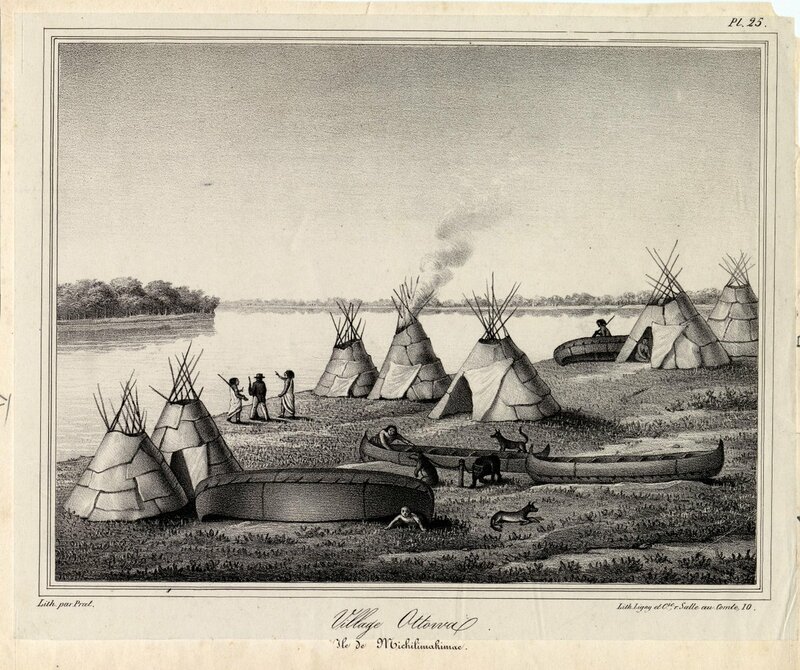 Main Library E99.P8 E35 : The Potawatomi Indians were the dominant tribe in the region of Wisconsin, Illinois, Indiana, and southern Michigan during the seventeenth and early eighteenth centuries. Active participants in the fur trade, and close friends with many French fur traders and government leaders, the Potawatomis remained loyal to New France throughout the colonial period, resisting the lure of the inexpensive British trade goods that enticed some of their neighbors into alliances with the British. During the colonial wars Potawatomi warriors journeyed far to the south and east to fight alongside their French allies against Braddock in Pennsylvania and other British forces in New York....As French fortunes in the Old Northwest declined, the Potawatomis reluctantly shifted their allegiance to the British Crown, fighting against the Americans during the Revolution, during Tecumseh’s uprising, and during the War of 1812....The advancing tide of white settlement in the Potawatomi lands after the wars brought many problems for the tribe. Resisting attempts to convert them into farmers, they took on the life-style of their old friends, the French traders. Raids into western territories by more warlike members of the tribe brought strong military reaction from the United States government and from white settlers in the new territories. Finally, after great pressure by government officials, the Potawatomis were forced to cede their homelands to the United States in exchange for government annuities. Although many of the treaties were fraudulent, government agents forced the tribe to move west of the Mississippi, often with much turmoil and suffering....This volume, the first scholarly history of the Potawatomis and their influence in the Old Northwest, is an important contribution to American Indian history. Many of the tribe’s leaders, long forgotten, such as Main Poc, Siggenauk, Onanghisse, Five Medals, and Billy Caldwell, played key roles in the development of Indian-white relations in the Great Lakes region. The Potawatomi experience also sheds light on the development of later United States policy toward Indians of many other tribes.... Part of the Civilization of the American Indian series ; v. 145.series. Rethinking Michigan Indian history / Patrick Russell LeBeau. East Lansing, Mich. : Michigan State University Press, c2005. 215pp. with accompaning CD. Main Library E78.M6 L43 2005 : Rethinking Michigan Indian History is a teaching tool that honors the Chippewa, Ottawa, and Potawatomi and the twelve federally recognized tribes of Michigan by recognizing their role and place in Michigan history--exploring what most people know (or do not know) about them....Each lesson includes a background narrative, a set of hands-on activities, and provides easily understood and visual resources. Rethinking Michigan Indian History explores large issues of Indian stereotypes, the narrow focus on “great” Indian men, the lack of knowledge of treaties and treaty rights, and the role of maps to mislead or distort thinking about how history unfolds and the complexities of land ownership....The lesson that explores Indian stereotypes identifies their existence not only in U.S. consumer culture but also in K-12 classrooms. The goal, however, is not to rebuke the consumer for having bought Big Chief Sugar or the teacher for having young students construct one-dimensional canoes, paddles, and Indians out of paper and glue but to use those activities as a demonstration of what most people know about Indians. From this point, a foundation of facts can begin to replace stereotypes in the learning process....Demonstrating further how popular influences can control knowledge, the lesson on “great” Indian men shows that the popular preference for biographies of famous Indian warriors (Pontiac or Tecumseh) or individual women (Pocahontas or Sacagawea) narrows an understanding of Indians to symbolic representations and issues by ignoring their ongoing culture....The lesson on Indian treaties and maps explains and visually shows the reason the Chippewa, Ottawa, and Potawatomi lived in Michigan in 1760 and live in Michigan today in roughly the same places. Treaties are explored in a manner that is understandable to fourth graders through adults, by showing where Indians lived, the treaty boundaries, and tribal land holdings. This lesson also shows Indian cartography concepts and how maps may be made....What makes Rethinking Michigan Indian History unique and important is its non-confrontational and modular approach that challenges conventional thinking and teaching practices, while at the same time advocates change. The inclusion of graphic resources, handouts, and colorful maps makes this book necessary for the teacher, student, and the general reader who is interested in Michigan Indian history. Schoolcraft's expedition to Lake Itasca : the discovery of the source of the Mississippi / edited by Philip P. Mason. East Lansing : Michigan State University Press, 1993. 390pp. Main Library F597 .S36 1993 : Scientist, explorer, historian, and Indian agent Henry Rowe Schoolcraft's name must be included in the pantheon of early nineteenth-century adventurers who were in the vanguard of American expansion into the heart of the continent. While some, individuals like William Clark, Meriwether Lewis, John C. Fremont, and Kit Carson did not stop until they reached the Pacific Ocean, others took it as their task to explore the cast, unknown interior; chief among this group was Henry Rowe Schoolcraft. Originally issued by Michigan State University Press in 1958, Schoolcraft's Expedition to Lake Itasca contains a semi-official report of his 1832 trip to the upper Mississippi region. His purposes for exploring the area, now part of Minnesota, were to quell a feud between warring Chippewa and Sioux factions and to locate the Mississippi headwaters. Although he did not stop the fighting, Schoolcraft did discover the river's true source and left us an unsurpassed account of life in the region in the 1830s. Anyone interested in the early white exploration of the upper Midwest should own a copy of this valuable resource. Schoolcraft's narrative journal of travels : through the northwestern regions of the United States, extending from Detroit through the great chain of American lakes to the sources of the Mississippi River, in the year 1820 / edited by Mentor L. Williams. East Lansing, Mich. : Michigan State University Press, 1992. 520pp. Main Library F484.3 .S37 1992 : This important Henry Rowe Schoolcraft work, first issued by Michigan State University Press in 1953, is now available as the second title in MSU Press's Schoolcraft Series. The book was originally published in 1821 under the long and pretentious title Narrative Journey of travels through the Northwestern Regions of the United States, extending from Detroit through the Great Chain of American Lakes to the Sources of the Mississippi River, Performed as a Member of the expedition under Governor Cass, in the Year 1820; it recounts Schoolcraft's participation in the John C. Calhoun-sponsored 1820 expedition to explore the cast, uncharted territory stretching from the upper Great Lakes into what is now northern Minnesota....This volume, a marvelous blend of reportage, scientific findings, and the author's personal observations, contains a wealth of information about geography and topography woven together with vivid descriptions of scenic beauty, Native American culture, and day-to-day life as a member of an exploring expedition. Schoolcraft's Ojibwa lodge stories : life on the Lake Superior frontier / edited with a new introduction by Philip P. Mason. East Lansing [Mich.] : Michigan State University Press, c1997. 193pp. Main Library E77 .S382 1997 : A reissue of no. 1-15 (Dec. 1826-Apr. 11, 1827) of the weekly (irregular) manuscript magazine, published in Sault Sainte Marie, Mich. The smallpox genocide of the Odawa tribe at L'Arbre Croche, 1763 : the history of a Native American people / Constance Cappel ; with a foreword by Simon Otto. Lewiston, N.Y. : Edwin Mellen Press, c2007. 169pp. Main Library E99.O9 C36 2007 : The first contemporary study of the smallpox genocide against the Odawa, set within their history before 1763 to the present day, and carried out by the British during the French and Indian War. Survival and regeneration : Detroit's American Indian community / Edmund Jefferson Danziger, Jr. Detroit : Wayne State University Press,  260pp. Main Library E78.M6 D36 1991 : This book captures the heritage of Detroit's colorful Indian community through printed sources and the personal life stories of many Native Americans. During a ten-year period, Edmund Danziger interviewed hundreds of Indians about their past and their needs and aspirations for the future. This history is essentially their success story. In search of new opportunities, a growing number of rural Indians journeyed to Detroit after World War II. Destitute reservations had sapped their physical and cultural strength; paternalistic bureaucrats undermined their self-respect and confidence; and despairing tribal members too often found solace in mind-numbing alcohol. Cut off from the Bureau of Indian Affairs services, many newcomers had difficulty establishing themselves successfully in the city and experienced feelings of insecurity and powerlessness. By 1970, they were one of the Motor City's most "invisible" minority groups, so mobile and dispersed throughout the metropolitan area that not even the Indian organizations knew where they all lived. To grasp the nature of their remarkable regeneration, this inspiring volume examines the historic challenges that Native American migrants to Detroit faced-adjusting to urban life, finding a good job and a decent place to live, securing quality medical care, educating their children, and maintaining their unique cultural heritage. Danziger scrutinizes the leadership that emerged within the Indian community and the importance of personal networks and formal native organizations through which the Indian community's wide-ranging needs have been met. He also highlights the significant progress enjoyed by Detroit Indians-improved housing, higher educational achievement, less unemployment, and greater average family incomes-that has resulted from their persistence and self-determination. Historically, the Motor City has provided an environment where lives could be refashioned amid abundant opportunities. Indians have not been totally assimilated, nor have they forsaken Detroit en masse for their former homelands. Instead, they have forged vibrant lives for themselves as Indian-Detroiters. They are not as numerous or politically powerful as their black neighbors, but the story of these native peoples leaves no doubt about their importance to Detroit and of the city's effect on them. 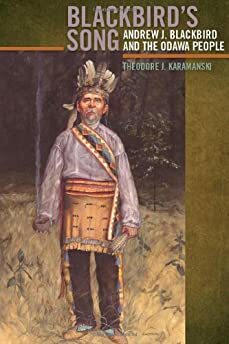 Tahquamenon tales : experiences of an early French trader and his native family / by Timothy J. Kent. Ossineke, Mich. : Silver Fox Enterprises, 1998. 208pp. Main Library F572.C54 K46 1998 : This account vividly brings to life the daily activities of a French trader of the 1600s and his woodland native family. The author recreated with great authenticity the items of daily life of the early native and French inhabitants of North America, based on over fifty excavation reports of seventeenth century sites as well as hundreds of documents dating from that era. Then he and his family spent ten years of summer vacations living with only those items. These men have seen hard service : the First Michigan Sharpshooters in the Civil War / Raymond J. Herek. Detroit : Wayne State University Press, c1998. 561pp. Main Library E514.9 .H47 1998 (Also available online from eBrary and EBSCO) : These Men Have Seen Hard Service recounts the fascinating history of one outstanding Michigan regiment during the Civil War. A compelling political, social, ethnic, and military drama, this book examines the lives of the 1300 men of the First Michigan Sharpshooters for the first time, beginning with the regiment's inception and extending through post-war activities until the death of the last rifleman in 1946. Beyond presenting numerous anecdotes about the men and officers and their contributions during the war, Raymond Herek provides insight into the medical community of the time, the draft, other commands in the same division, the politics endemic in raising a regiment, and Michigan's Native American contingent. Since Company K was a part of the 1st Michigan Sharpshooters, there story is covered as well. The extensive appendices will be of particular use to genealogists, Civil War enthusiasts, and historians, because they list the men in the regiment, and also battle and camp casualties. 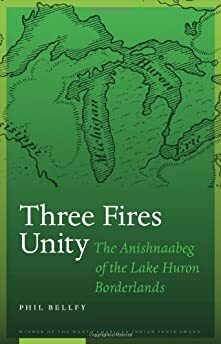 Three Fires unity : the Anishnaabeg of the Lake Huron borderlands / Lincoln : University of Nebraska Press, c2011. 2039pp. Main Library E99.C6 B426 2011 (Also available online) : The Lake Huron area of the Upper Great Lakes region, an area spreading across vast parts of the United States and Canada, has been inhabited by the Anishnaabeg for millennia. Since their first contact with Europeans around 1600, the Anishnaabeg have interacted with—and struggled against—changing and shifting European empires and the emerging nation-states that have replaced them. Through their cultural strength, diplomatic acumen, and a remarkable knack for adapting to change, the Anishnaabeg of the Lake Huron Borderlands have reemerged as a strong and vital people, fully in charge of their destiny in the twenty-first century....Winner of the North American Indian Prose Award, this first comprehensive cross-border history of the Anishnaabeg provides an engaging account of four hundred years of their life in the Lake Huron area, showing how they have been affected by European contact and trade. Three Fires Unity examines how shifting European politics and, later, the imposition of the Canada–United States border running through their homeland, affected them and continues to do so today. In looking at the cultural, social, and political aspects of this borderland contact, Phil Bellfy sheds light on how the Anishnaabeg were able to survive and even thrive over the centuries in this intensely contested region. 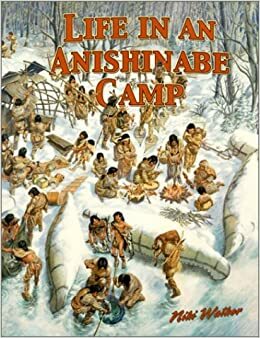 Life in an Anishinabe camp / Niki Walker. New York : Crabree Pub. Co., c2003. 32pp. Children's and YA Literature Collection (1 East) picture E99.C6 K35 2003 : Reading Level: Age 9 and up. This is a very useful book, with extensive pictures of Indian camps of the northern US and Canada, favoring Algonkian indians. Anishinabe is the original word for Algonkian, Ojibwa, Chippewa, and other such words. By way, wigwams circulate heat far more effectively than square houses. If you compare the pilgrim houses, in that Massachusetts museum at Plymouth, with the wigwams, the pilgrim houses were at most 10 degrees warmer, F., than outer temperature, in the winter, while Wigwams were a good 30-40 degrees warmer, F., in winter. The Iroquois longhouse became the Quonset Hut, of WW II fame, which is an Iroquois longhouse built of metal, sometimes on a concrete foundation. Cover. Michigan native Americans : a kid's look at our state's chiefs, tribes, reservations, powwows, lore, and more from the past and the present / by Carole Marsh. [Peachtree City, Ga.] : Gallopade International, c2004. 36pp Children's and YA Literature Collection (1 East) E78.M6 M377 2004 : This children's resource book is full of great information about Native Americans in Michigan. The alphabetical order applied to these facts keeps interest high and they are a great starting point for further learning. Michigan Native Peoples / Marcia Schonberg. Chicago, Ill. : Heinemann Library, c2004. 48pp. Children's and YA Literature Collection (1 East) E78.M6 S36 2004 : Reading level : Age 7 and up. Schonberg begins her book in a most refreshing way: by stating flatly that much of Native American history is inaccurate. "Facts" may be filtered through the interpretations of archeologists and scientists, and the oral histories of the Indians themselves change from telling to telling. "What is written as history can be based on how different people saw an event," Schonberg notes. That said, she does a respectful job of telling the current facts and theories of the state's native people, from earliest times through today's "Three Fires Confederacy," a trio of dominant Michigan tribes. She gives decent coverage to the years both pre- and post-contact with Europeans, and offers up some interesting facts that might not be known outside Michigan, such as "Pontiac's Rebellion," a three-year campaign against Europeans who refused to honor treaties. Part of the "Heinemann State Studies" series, this book is handsomely produced with many color photos, illustrations and maps that help history come alive. 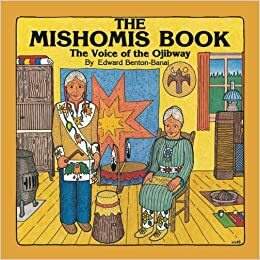 The Mishomis book : the voice of the Ojibway / by Edward Benton-Banai. Saint Paul, Minn. : Red School House, c1988. 114pp. E99.C6 B44 1988 : The Ojibway is one of the largest groups of Native Americans, belonging to the Anishinabe people of what is today the northern United States and Canada. The Mishomis Book documents the history, traditions, and culture of the Ojibway people through stories and myths passed down through generations. Written by Ojibway educator and spiritual leader Edward Benton-Banai, and first published in 1988, The Mishomis Book draws from the traditional teachings of tribal elders to instruct young readers about Ojibway creation stories and legends, the origin and importance of the Ojibway family structure and clan system, the Midewiwin religion, the construction and use of the water drum and sweat lodge, and modern Ojibway history. Native Nations of the Western Great Lakes. New York : Crabree Pub. Co., c2003. 32pp. Children's and YA Literature Collection (1 East) picture E99.A35 .K35 2003 : Describes the cultural similarities and differences between the many Algonkian-speaking nations -- including the Menominee, Sauk, Fox, and Anishinabe -- who once called home to the Great Lakes woodlands, examining their homes, hunting and farming practices, and the importance of family. Simultaneous. Introduces readers to the traditional lifestyles of Native nations who lived in the western Great Lakes region, as well as the impact of colonization on Native peoples. Ojibwa / by George L. Cornell and Gordon Henry Jr. Philadelphia : Mason Crest Publishers, c2004. 94pp. Main Library Stacks E99.C6 C83 2004 : North American Indians today series North American Indians are not merely a historical topic. Instead, today's Native Americans are living, productive members of North American society. The contributions of the various Indian cultures enrich our lives in countless ways. For instance, "Indians have the strongest sense of place of anyone in the world," says Amy Mossett, a Native scholar (quoted in the New York Times). This sense of place is reflected in American Indians' connection to the Earth, an intimate relationship that has concrete implications for the way we handle environmental issues. Indians' connection to the traditions of their ancestors is also strong. At the same time, however, Native Americans are modern people confronting the challenges of today's world. They gain strength for the present from their deep foundations in the past. What's more, Native traditions and wisdom have much to offer us all. North American Indians Today portrays contemporary Indians within the present-day context of their relationship to their land, their past, their traditions, and their 21-st century realities. The heritage and history of each tribe is given as background to chapters on the current government, society, culture, religion, contributions, challenges, and goals of each tribe. Each volume was written with the help of Native people, and tribal leaders and scholars reviewed and approved the text for their tribes. The series consultant, a Native American expert from the University of Nebraska, ensured that the text is free from cultural bias. This series' respectful and accurate text, as well as the color photographs and Native artwork, will give readers a broader understanding of today's North American Indians, theirconnection to their land and their past, and their contributions to our modern-day world. For more possibilities about Native American literature in general, see American Indian Library Association's American Indian Youth Literature Awards. American Indians in Children's Literature. Established in 2006, American Indians in Children's Literature (AICL) provides critical perspectives and analysis of indigenous peoples in children's and young adult books, the school curriculum, popular culture, and society. Courtesy of Debbie Reese. Nadean Meyer, "Selecting Diverse Resources of Native American Perspective for the Curriculum Center: Children’s Literature, Leveled Readers, and Social Studies Curriculum", Education Libraries, Volume 34, no. 1, Summer 2011, p23 on. Available in the open access journal Education Libraries. Anishinaabe outfit collected by Andrew Foster ca. 1790 at Fort Michilimackinac, Michigan. Outfit made with birchbark, cotton, linen, wool, feathers, silk, silver brooches, porcupine quills, horsehair, hide, sinew. The National Museum of the American Indian Andrew Foster Collection. For more information visit the National Museum of the American Inidan website. Robert Downes, "The Indians in Winter: How they survived -- and thrived -- in a frozen land", Northern Express, March 13, 2011. Have you ever wondered how the Indians of Northern Michigan lived through the cruel, cold winter months just a few generations ago? Turning Point: the War of 1812 from the Native American Perspective Current exhibit at Harbor Springs History Museum. The exhibit, produced in collaboration with the Little Traverse Bay Bands of Odawa Indians and its Repatriation, Archives and Records Department, examines this “forgotten” war and its impact on the Odawa people of Little Traverse Bay. The exhibit will be on display during exhibit hours through May 2014. Exhibit curator : Eric Hemenway. The collection of houses across the river on its west side is the Baptist mission. The three buildings in the middle right are Louis Campau's trading post. In the foreground an Indian teepee and tent. Compare to 1831 government sketch of Grand Rapids provided by Lucius Lyon. Few men could pass the marksmanship test. Since Michigan's Native Americans were famous as skilled hunters, it was decided to recruit one company - Company K - from among the tribes in Michigan. Nearly140 men volunteered for Company K in the 1st Michigan Sharpshooters regiment. Each man passed the test, hitting a 5 inch circle from a distance of 220 yards. For Basic Training, they were sent to Dearborn, Michigan. The soldiers of Company K wore the same uniform and received the same pay as the rest of the Regiment. The Road to Andersonville : Michigan Native American Sharpshooters in the Civil War / Producer, David B. Schock. [Holland, Mich.] : penUltimate, Ltd., 2013. 1 DVD videodisc (111 min.) : sd., col. ; 4 3/4 in. E540.I3 R62 2013 VideoDVD (Also available online) : A documentary on Native American soldiers who served in Michigan's Company K during the Civil War. Includes a segment about a trip by present day Native Americans to honor the Anishinabe of Michigan who died at Andersonville Prison....During the American Civil War, Union forces ran low on sharpshooters. In Michigan, the answer was to change a law prohibiting Native American military service, and then—in 1863—to ask members of the Three Fires Tribes (Odawa [Ottawa]), Bodewadmik [Potawatomi], and Ojibway [Chippewa]) to enlist. These were men who lived in peaceful coexistence with their neighbors, Native American and white alike, and who also possessed legendary woodland and hunting skills. There existed among these men the important tradition of a warrior society, the Ogitchedaw, whose members were required to partake in battle....The Native Americans knew they were not likely to be well treated; they knew all too well the intentions of the whites who routinely effected displacements of other tribes resulting in horrific events such as The Trail of Tears in 1838. The Native Americans knew their way of life was at risk, and their accumulating losses of lands and culture were everywhere apparent. However, they also knew that if the South was successful in its campaign during the Civil War, they would likely be relegated to the status of slaves. Therefore, the members of the Three Fires Tribes responded with alacrity and in number: The first was Thomas “Big Tom” Kechittigo from Saginaw on May 3, 1863. Twenty five men from the Elbridge Reservation near Pentwater in Oceana County joined on July 4, 1863. Twenty-eight Ojibway from the Isabella reservation enlisted. A dozen Potawatomi also joined the ranks. Some others traveled from southwest Michigan to enlist in Company K. A few trekked from Canada. The Native Americans arrived at the Dearborn Arsenal to be trained into a cohesive fighting unit as members of Company K, First Michigan Sharp Shooters, the only all Native American unit in the North. Not one member of the 139 was Ogitchedaw; that meant not one member had experienced battle....And these men saw hard service in most of the major battles remaining in the war. In all, one fourth of the men of Company K were either killed or wounded in battle....While many gave the ultimate sacrifice on the battlefield, some of the Sharpshooters were captured. After the Battle of Petersburg, 15 of their number were sent to a living hell: the prison camp at Andersonville. According to the National Parks Service, of 45,000 prisoners, almost 13,000 died of starvation and/or disease. Of the 15 from Company K, seven died and were buried there. At the time of the beginning of this film, they had lain at Andersonville for nearly 150 years without receiving their burial ceremony....About a dozen descendants of Company K and others of the present day Anishinabe Ogitchedaw Veteran and Warrior Society traveled to Andersonville, Georgia, in May of 2010 to honor the graves of the men. These travelers motored from Michigan to Andersonville to offer their prayers and pay homage and respect to the spirits of the men of Company K there buried....This film is the story of that journey and the telling of the tale of the 139 men who joined as members of Company K, their recruitment, the training, their battles, and their deaths and survival....In addition to members of the Ogitchedaw and other descendants of the men of Company K we hear from Company K historians Ray Herek (These Men Have Seen Hard Service) and Chris Czopek (Who Was Who in Company K). The Road to Andersonville trailer and description. Another Trailer. Who was who in company K : reliable facts about the Native American soldiers in Company K, 1st Michigan Sharpshooters, during the Civil War 1861-1865 / researched by Chris Czopek. Lansing, Michigan : Red Oak Research, 2010. 224pp. Main Library Statistics E540.I3 C96 2010 : "This book will tell you: the name of each soldier- where he came from (Indicating his tribe) - what happened to him during the war- and where he went after the war was over"
Roy Morris Jr., "Michigan’s Ottawa Indians in the American Civil War", Warfare History Network, January 13, 2015. Gordon Berg, "American Indian Sharpshooters at the Battle of the Crater", originally published in the June 2007 issue of Civil War Times Magazine. American Indians and the Civil War / Robert K. Sutton and John A. Latschar, editors. [Fort Washington, PA] : Eastern National,  215pp. E540.I3 A67 2013 : Official National Park Service Handbook. Includes chapter “Soldiers in the Shadows : Company K 1st Michigan Sharpshooters” about Company K written be Erik Hemenway. Between Two Fires : American Indians in the Civil War / Laurence M. Hauptman. New York ; London : Free Press, c1995. 304pp. Main Library E540.I3 H38 1995 : Contains extensive information about Company K.
These men have seen hard service : the First Michigan Sharpshooters in the Civil War / Raymond J. Herek. Detroit : Wayne State University Press, c1998. 561pp. 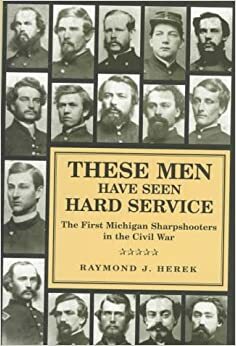 Main Library E514.9 .H47 1998 (Also available online from eBrary and EBSCO) : These Men Have Seen Hard Service recounts the fascinating history of one outstanding Michigan regiment during the Civil War. A compelling political, social, ethnic, and military drama, this book examines the lives of the 1300 men of the First Michigan Sharpshooters for the first time, beginning with the regiment's inception and extending through post-war activities until the death of the last rifleman in 1946. Beyond presenting numerous anecdotes about the men and officers and their contributions during the war, Raymond Herek provides insight into the medical community of the time, the draft, other commands in the same division, the politics endemic in raising a regiment, and Michigan's Native American contingent. Since Company K was a part of the 1st Michigan Sharpshooters Regiment, their story is also covered here. The extensive appendices will be of particular use to genealogists, Civil War enthusiasts, and historians, because they list the men in the regiment, and also battle and camp casualties. Native Americans visit Poplar Grove National Cemetery to visit warriors, article by F. M. Wiggins, Progres-Index, December 3, 2013. Excerpt: Among the more than 6,000 dead Civil War soldiers buried at Poplar Grove National Cemetery are several true warriors. Men who tried several times to volunteer to serve the Union Army before finally being accepted....The approximately half-dozen men from 1st Michigan Sharpshooters, Company K, who are buried at Poplar Grove are part of a little-known aspect of Civil War history - Native Americans that fought in the war...."They had been part of my tribes oral tradition for as long as I can remember," said Eric Hemenway. Hemenway is part of the Odawa - also known as Ottawa - a tribe from Michigan. Hemenway and representatives from a half-dozen of the 30 tribes in Michigan including representatives from the Cree, Potawatomi and Ojibwe - also known as Chippewa - recently visited Poplar Grove National Cemetery and Petersburg National Battlefield to learn more about the 1st Michigan Sharpshooters, Company K.
"Researcher Tells Story of Michigan Indian Sharpshooters Who Served in Civil War". Ted Booker, St. Ignace News, January 20, 2011. Loraine Anderson, "History Buff Drawn to Company K", Traverse City Record-Eagle, April 12, 2011. "Company "K" 1st Michigan Sharpshooters (YouTube). 1st Michigan Sharpshooters Co.K Native Americans in The Civil War featuring an interview with Chris Czopek. "Inured to hardships, fleet as deer". Gordon Berg. Civil War Times Illustrated (June 2007), p.56. American Indian sharpshooters fought gallantly beside their black and white comrades in blue in the chaos of the Crater. Lieutenant Freeman S. Bowley was fighting for his life in the man-made hellhole that was the Petersburg Crater when he noticed that the former slaves in his company of the 30th United States Colored Troops were not the only men of color wearing Union blue and dodging Confederate Minié balls on the stifling hot morning of July 30, 1864. "Among our troops was a company of Indians, belonging to the 1st Michigan S.S. [Sharpshooters]," recalled Bowley many years later. "They did splendid work, crawling to the very top of the bank, and rising up, they would take a quick and fatal aim, then drop quickly down again." Michigan residents can access this article via MeL. Choose full text magazines and newspapers, choose eLibrary, click on the magazines icon, type in Civil War Times Illustrated. By fighting on the Union side, many Native Americans hoped to gain favor with government authorities, perhaps to mitigate any demands that they be driven West of the Mississippi. Company K Sharpshooters are show here recovering from injuries received in the Battle of the Wilderness in May of 1864. The Ogitchedaw Veterans and Warriors Society make a historic trip to Andersonville, Georgia, May 2010, to honor the graves of their ancestors who were imprisoned and died there. “20 Indian Boys From Government School at Mt. Pleasant Accepted for Service in Army and Navy", Mount Pleasant Times (MPT), June 7, 1917, page 1. Visit Clarke Historical Library News and Notes, March 3, 2014. Michigan Indian Day was established as the 4th Friday in September by the State of Michigan in 1974. 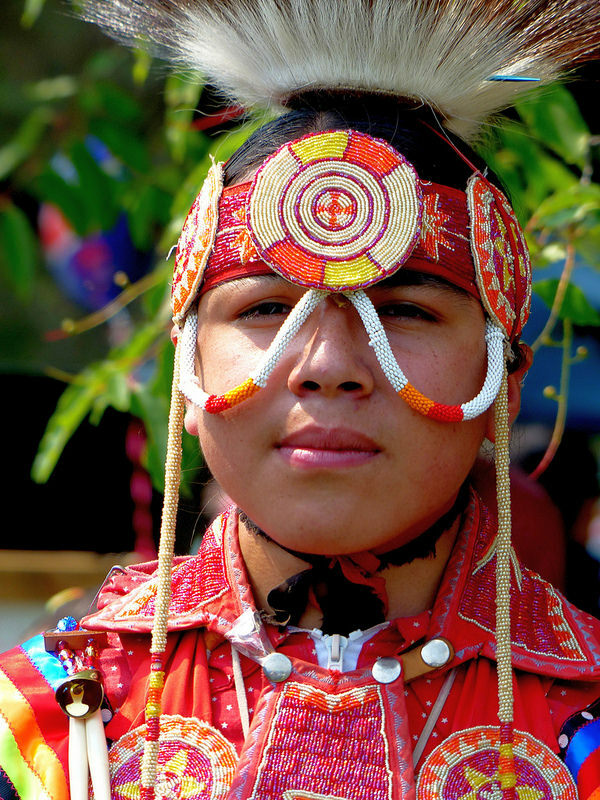 Sharon took this at the 2014 Odawa Homecoming Pow Wow in Harbor Springs. View it bigger and see more in her slideshow. Blue Moon Rizing/Northern bear started as a youth drum group back in June 2003 in Lowell, Michigan. Gage is the drummer, he is 11 years old and a member of the Pokagon Band of Potawatomi. They come from Southwestern Michigan and Northern Indiana. Questions about Michigan Native American Relics?